What is an extended tummy tuck? In many cases, pregnancy can cause a buildup of loose, excessive skin that extends beyond the abdomen. When loose skin can be seen on the flanks in addition to the tummy, an extended mommy tuck is the correct procedure to eliminate excess skin and tighten the underlying musculature. If a surgeon ignores that excess skin in order to get a shorter scar, the patient will be left with a so-called dog-ear deformity. When this occurs, you’ll require revision surgery later on. 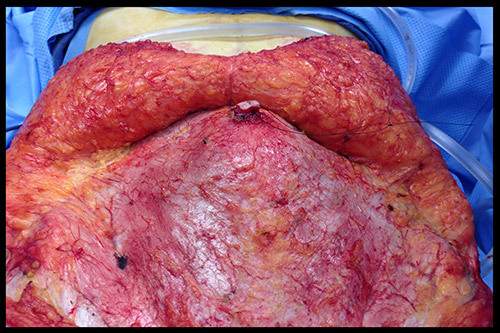 For this reason, it is crucial that your surgeon makes the incision long enough to accommodate all excess skin. A tummy tuck is not about the length of the incision, but rather the contour of the abdomen. A shorter scar with poor contours is not better than a slightly longer scar with smooth and beautiful contours. In determining candidacy for an extended tummy tuck post pregnancy, there are several factors to consider. A good candidate for an extended tummy tuck has accumulated some loose, sagging skin on the tummy and the flanks, generally after pregnancy or significant weight loss. If you are looking to attain your pre-pregnancy, youthful body, you can count on Dr. Rahban to provide among some of the best mommy makeovers Beverly Hills has to offer. As the belly expands during pregnancy, it does not only affect the outer skin—it also stretches the underlying abdominal muscles apart, a condition known as rectus diastasis. Warning: The images below include graphic content. As you can see, the two columns of abdominal muscles are pushed to the side. This means they fire sideways, not forward. This phenomenon causes the abdominal muscles to provide less core support, leading to pain in the lower back. That being said, extended tummy tuck candidates may also be suffering from a weakened and stretched abdominal wall. In this case, an extended tummy tuck will tighten these underlying muscles, restoring a slim, lean appearance to underlying layers. In addition to the above, extended tummy tuck candidates should be in good health and close to their ideal body weight. We don’t want to embark on any body contouring procedure and then plan on losing more weight, as you will then develop more loose skin and ruin your results. Therefore, Dr. Rahban highly encourages his patients to be around their goal weight prior to any surgery. Note: while each surgeon approaches the consultation process differently, Dr. Rahban feels they should all have the same basic elements, ensuring patients leave very well informed regarding surgery. Below is how Dr. Rahban conducts a consultation. Your consultation should be done by your plastic surgeon and not by his staff, such as his coordinator. In many cases, patients are offered free consultations, but you must understand that often means you’ll get a hurried consult. As a point of reference, Dr. Rahban on average spends up to an hour with each patient, reviewing not only what the patient came in for, but also explaining all the nuances such as the risks and alternatives to what that patient has requested. There is no way to accelerate the dissemination of knowledge when it is so complicated and crucial. During a postpartum extended tummy tuck consultation, Dr. Rahban covers several crucial points. Firstly, he gathers data regarding your specific cosmetic objectives. After all, the goal is your satisfaction and confidence. Plastic surgery is all about what you are trying to accomplish. Just because a surgeon likes a result, it does not mean you will like it. In all plastic surgery, you are the unique element in the equation. Second, after an examination, Dr. Rahban defines the exact problem, allowing you to better understand what your body has been through. In many cases, patients are confused regarding the effects of pregnancy on their own body. Dr. Rahban’s task is to help such patients fully understand what has happened, giving them perspective on how a Mommy Makeover will address any issues. Next, Dr. Rahban lays out your options, including incisions, amount of skin to be excised, and other factors involved in determining which kind of tummy tuck is best for you. This is where modern plastic surgery differs from times past—it used to be paternalistic, in which the surgeon simply decides what’s best for the patient. These days, plastic surgery is collaborative. Dr. Rahban goes through all options and recommends what he think is the best option. He concurrently educates the patient on everything that is open to her, allowing her to fully contribute her personal preference. As an extension of this, Dr. Rahban also reviews what patients should not expect from surgery. He is well known for telling his patients the truth and establishing a healthy level of expectation. Most patient dissatisfaction is related to inaccurate understanding and expectation of their surgery. Dr. Rahban deals in full disclosure to prevent this from occurring. In the interest of helping his patients fully understand the procedure, Dr. Rahban will take this opportunity to review all potential risks. While some risks are quite unlikely, he still wants his patients to be aware of the potential downsides of surgery. All surgeries come with risks. Therefore, he believes the only time to engage in surgery is if the benefits far outweigh the risks. If you will only have a mild improvement, Dr. Rahban will most definitely recommend you do not undergo the procedure. During a consultation, Dr. Rahban has one primary purpose—total patient education. He wants each patient to fully understand the nuances of extended tummy tuck surgery, as well as every risk and exactly how the procedure applies to them, allowing them to make the best decision for themselves. With his honest, candid approach, Dr. Rahban brings a new level of care to ensuring his patients know exactly how an extended tummy tuck works. Note: while no two surgeons perform this procedure identically, most techniques have a similar series of steps. Below is a brief overview of Dr. Rahban’s technique, allowing you to gain a more detailed understanding regarding how your surgery will be performed. The more you know, the more control you have. The incision is made. The length of the incision is not determined by how long you want it to be, but rather how long it needs to be. By leaving an incision shorter than it ought to be, a surgeon will leave excess skin behind, creating what’s called a dog-ear deformity. This dog-ear will need to be excised at a later time, creating the same length incision you would have had in the first place, had you addressed this appropriately during surgery. In an extended tummy tuck, the incision must be extended further than usual to avoid creating a dog-ear deformity. An extended tummy tuck incision generally extends from the back of one hip, sweeping downward in a semi-u shape around the front, and to the back of the other hip. In delivering an extended tummy tuck, Dr. Rahban places the incision as low on the abdomen as possible, allowing it to be hidden by underwear or bikini bottoms. Once the incision is made, Dr. Rahban elevates the skin and fat off the abdominal muscles, allowing the skin to be recruited and giving him access to the underlying muscle layer. 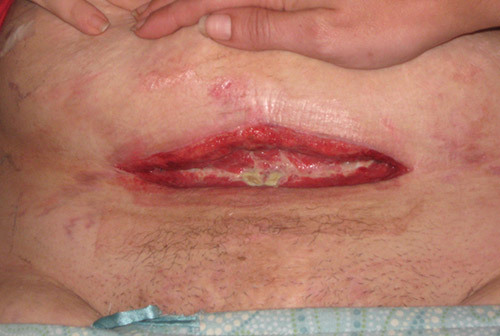 At the same time, he separates the belly button from the surrounding skin, leaving the belly button attached to its original location. He does not cut the belly button off or make a new belly button. As the final step of the extended tummy tuck, he will make a new opening for your your existing belly button. Next, by directly visualizing your muscles, Dr. Rahban will determine how much damage has occurred due to pregnancy. He will repair and reunite the muscles, thereby giving strength to the abdomen. He does this in two distinct layers so in the event that one of the sutures breaks, there is a backup. This area, as you can imagine, will undergo a lot of strain as a patient starts to move and exercise. To compensate for this, Dr. Rahban doesn’t do a running whipstitch, which can be undone in its entirety if only one section breaks. Instead, he throws individual sutures on top of a whipstitch, reinforcing the entire reconstruction. Next, Dr. Rahban will rejuvenate the pubic area and the mons. Plastic surgeons will often ignore the pubic region, leaving it sagging and puffy. They only rejuvenate the abdomen and reattach it to a puffy mons. With every single tummy tuck, Dr. Rahban rejuvenates the mons or pubic region. He removes excess fat from underneath the mons and removes excess skin. He then lifts up the mons and re-secures it to the abdomen, creating a younger looking pubic area. Next, Dr. Rahban pulls the excess skin down, allowing him to see exactly how much skin should be removed. While one may think that more is better, this is where Dr. Rahban’s decision comes into play. If too much skin is excised, the pubic hair and incision will be pulled upwards above the underwear line. The scar will be under tension and thicken over time, and the abdomen will look shorter. Dr. Rahban carefully removes excess skin, leaving just the right amount for the abdomen to look naturally fit and firm. Next, Dr. Rahban closes the incision. Many cosmetic surgeons allow another person to close the patient—usually a surgical tech or an assistant surgeon you’ve never met. This is not the case with Dr. Rahban—he doesn’t let anybody else touch his patient. His closing techniques are exquisite, using an enormous number of sutures so very little tension is placed on any single suture. With minimal tension, the resultant scar is virtually invisible. Dr. Rahban closes every layer to ensure there is no depression on the scar. With layered closer, he ensures the transition between abdomen and pubis is smooth, not creating an additional ridge or lip. As an added precaution, Dr. Rahban closes starting from the hips and works his way into the center of the abdomen. This ensures no dog-ear deformity is present. There is another component to closing a tummy tuck incision. The abdominal skin is much thicker than skin closer to the pubis. If these two different-sized layers are sutured together, there will be an obvious deformity due to the difference in thickness. To compensate, Dr. Rahban removes extra thickness in the abdominal skin, allowing it to fuse seamlessly with skin in the pubic area. As the final step, arguably the most important part is the reconstruction of your belly button. The number one complaint by most patients is that despite having had a tummy tuck, because of a poorly reconstructed belly button, they are unable to wear revealing clothes because it’s so obvious they’ve had it done. After years of working on his technique, Dr. Rahban has created a unique belly button reconstruction or umbilicoplasty. The key to a natural looking belly button is round, relatively small and retracted. The signs of an obviously “done” belly button are: the sundial appearance of visible scars and a large, elliptical belly button. Dr. Rahban does the umbilicoplasty as the final step of the procedure, sometimes taking upwards of thirty minutes. He does it last so he can ensure the belly button’s appropriate location, as there is nothing worse than a belly button that’s extremely low. For patients receiving an extended tummy tuck post pregnancy, preparation begins about two weeks before the procedure. Every patient goes through a thorough pre-operative process. This begins with a pre-op visit two weeks prior to surgery. This is similar to a second consult. During this time, you will go over the details of your surgery with Dr. Rahban, and you will get a second opportunity to ask questions and go over your procedure, thus ensuring a complete understanding. In the world of plastic surgery, this second visit is unusual. However, because the first visit can sometimes be overwhelming, patients often come up with new questions latently. Dr. Rahban provides this second visit so his patients can be completely at ease with every question answered. Dr. Rahban and his staff will provide all the dos and don’ts prior to your surgery. They’ll include a laboratory evaluation and any other workup to ensure your complete safety. If Dr. Rahban feels you are not ready to undergo your procedure for health reasons, he will assuredly cancel your procedure. His only interest is that you are safe to undergo surgery. Dr. Rahban and his office will additionally give you step-by-step instructions for the days and weeks leading up to surgery. These instructions will include all actions necessary to prepare for your day of surgery, such as what medications to stop taking, and plenty of other guidelines to ensure you are physically fit to undergo surgery. If you have any questions prior to your surgery, our office is available to you. Call or email us any time, and we will help with anything you need. Our goal is total peace of mind for our patients, as well as a safe, successful procedure. Note: the recovery listed below is according to Dr. Rahban’s routine. Other surgeons may have a different approach to the recovery process. Directly after a tummy tuck, you will remain in our recovery suite for an hour until you are ready to go home. Because the effects of anesthesia do not fully wear off for 24 hours, you will need assistance during this initial period, including a ride home. If you are alone in the city, Dr. Rahban and his staff will make arrangements for individuals who can help you throughout your process. At home, it is wise to set a centralized location to relax, with medications and other necessities within easy reach. During the first week, you must use your abdominal muscles as little as possible. If you live in a house with stairs, it is best to avoid them if possible. Tummy tuck patients need to sleep in what we call the lawn chair position. By bending at the waist, you will ensure your incision is not under tension while it heals. This also means that patients must walk bent over for the first week. Additionally, you will not be able to drive for the first week following surgery. Driving is allowed once you can respond to oncoming traffic. When receiving a tummy tuck, the healing process is crucial to a beautiful result. For this reason, our office will ask that you strictly adhere to our list of post-operative guidelines. It’s of paramount importance that you do your part. Dr. Rahban and his staff will hold you accountable to your portion of your own successful recovery. We will give you a full list in our office, but below are several examples so you know what to expect. At the time of your surgery, your wound will be sterile, and it will be covered with a sterile dressing. Dr. Rahban will ask you to keep that dressing on for seven days. While some patients feel as though their wounds are getting dirty, it is exactly the opposite. Non-sterile materials such as fingers and water introduce bacteria that cause infections. When you open your wound to clean it, you’re laying it open. Because of the dressing, you should take sponge baths for the first week. This not only makes your life easier, but also helps ensure the incision doesn’t get infected. After that, Dr. Rahban will give you further instructions as far as maximizing your cosmetic outcome and minimizing your scars. During the first week, Dr. Rahban recommends that you get up and move around the house in order to prevent blood clots. At the same time, limit your activities to mild movement. There should be no lifting greater than 5 pounds and no cardio for 6 weeks. These actions will put strain on your wounds, leading to obvious scarring and, in some cases, the incision can open back up. Dr. Rahban will ask that you remain in the “lawn chair” position at all times during the first week, even walking bent over so as not to put any strain on the incision. The first week following surgery, you will be taking pain medication, along with antibiotics to prevent infection. Additionally, you will take a stool softener, as the abdominal muscles will be healing from the procedure. Dr. Rahban strongly believes in the use of an abdominal binder following his abdominal procedures. He will ask you to wear an abdominal binder for a total of six weeks to ensure the best outcome. He feels the abdominal binder helps mold the abdomen into the desired appearance, in addition to limiting complications such as fluid accumulations called seroma. This binder must remain on for the first week after surgery. You will have two small drains following a tummy tuck, which will help eliminate fluid that is accumulated in the space created during the surgery. The drains will most likely be removed within 4-7 days, depending on the degree of fluid generated. Dr. Rahban’s approach to drains is unique. Most surgeons use a completely separate incision for the drains, usually in the mons or the patient’s sides. The obvious problem with this is it creates new scars in addition to the primary tummy tuck scar. 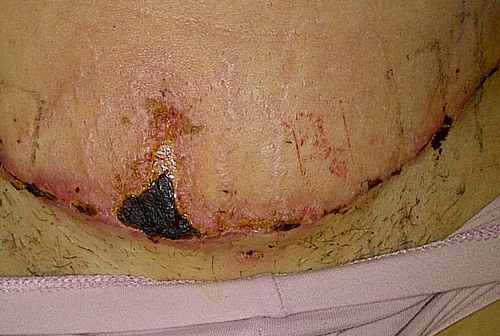 After a tummy tuck, the last thing a patient wants is a circular scar in the pubic area. Dr. Rahban uses the existing incision for the drains, preventing the need for further incisions and scars. After a tummy tuck, Dr. Rahban schedules a total of five follow-up appointments. Most plastic surgeons schedule two follow-ups, during which time you may not even see the doctor. During every follow-up appointment, Dr. Rabhan sees his patients personally. He believes it is the patient’s responsibility to follow up with him. This is because patients may not know something is wrong until they see a professional. From Dr. Rahban’s viewpoint, plastic surgery is a team approach, and you must do your part by showing up to your follow-up appointments. In addition to the pre-scheduled follow-up appointments, Dr. Rahban is available to his patients at any time after surgery. If there are any questions or concerns that arise, he and his office are available to help. Just give us a call and we will provide every bit of assistance. This can occur if the wound is closed too tight or not closed well enough. In order to minimize the potential of wound separation, Dr. Rahban is very careful with how much skin he removes during your tummy tuck. All too often, surgeons are overly aggressive, removing too much skin, thereby putting too much tension on your scar. This can lead to separation of your wound. This occurs when the tissue, such as the belly button or the edge of your wound, does not receive sufficient blood supply. When this happens, that tissue cannot survive and will die and turn dark, necessitating excision or removal of that tissue. Several factors that lead to this include smoking, poor health such as heart disease and diabetes, or excessive tissue dissection by your surgeon. In order to minimize this complication, Dr. Rahban requires his patients to quit smoking a month prior to surgery and generally be in good health going into surgery. His primary action, however, is to be conservative with his dissection during your tummy tuck. While an inevitability of surgery, the issue is not whether you will have a scar, but rather the quality of your scar. The goal is for you to have a well-healed, faint or fair scar with time. In order to prevent the unsightly scar that so many people are worried about, Dr. Rahban takes steps to minimize it. Dr. Rahban believes in a 50-50 rule. Fifty percent of scar healing has to do with the technique of your surgeon’s closure, or how well the incised tissues are brought back together. The other fifty percent is the patient’s biology. Because a patient has little control over her biology, there is a lot of emphasis placed on your surgeon and his closure technique. While many surgeons place their emphasis on post-operative scar management, there is very little science that any of these modalities actually work. Therefore, Dr. Rahban focuses on an unusually fastidious closure technique to ensure that all tissues heal with minimal scarring. Please refer to his timeline on wound management for more information. This is a very rare complication. Despite this, we take action to minimize the risk as much as possible. This primarily includes having the patient stop all medications that promote bleeding at least two weeks in advance, such as anti-inflammatories, aspirin and supplements. Also quite rare, infection is thoroughly combatted before, during and after surgery. The night before surgery, we have patients wash themselves with an antiseptic soap. We give patients antibiotics directly prior to surgery, as well as after surgery. Additionally, Dr. Rahban has very strict post-operative instructions regarding wound management that he believes reduces the risk of infection. There are several types of blood clots. They can occur in the leg, which will produce undesired effects. Much more severe and dangerous, they can also occur in the lungs. 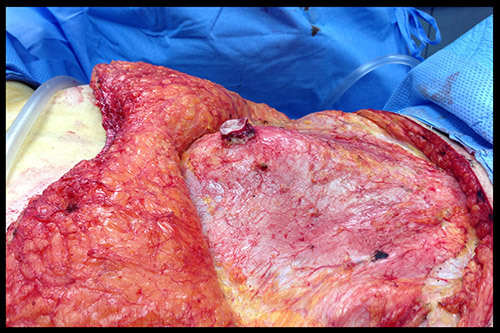 When performing surgeries, especially abdominal surgeries, the risk of blood clots increases. In order to minimize or reduce that risk, Dr. Rahban performs several key steps. Number one, he uses compression stockings on your legs during surgery, in order to cause blood to flow smoothly while you’re asleep. Second, he gives you an intraoperative dose of a blood thinner known as heparin. Finally, he requires for you to immediately walk around after surgery, allowing your circulatory system to continue working properly. This occurs when your body generates fluid underneath your skin that it cannot absorb, thereby necessitating aspiration of the fluid during your recovery. In order to minimize this complication, Dr. Rahban is very adamant that you wear your binder for the entirety of the six weeks. 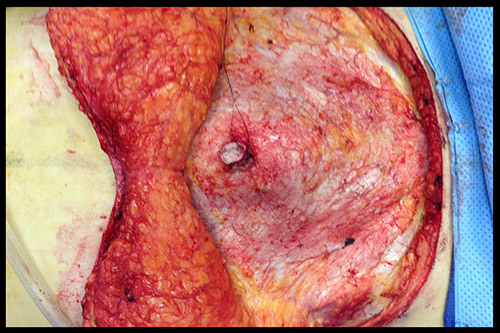 This compression will limit or minimize the chance of a seroma forming. In addition, he is very strict about no exercise during this timeframe, as exercise will promote fluid formation. I don’t short change the incision and compromise contour. An extended tummy tuck is a contour surgery. 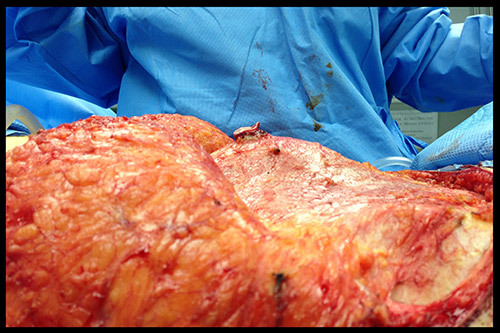 When you finish this surgery, your abdomen should be smooth and have a beautiful shape. As a surgeon, I do whatever it takes to produce this result. The incision is as long as it needs to be to get that cosmetic result. If I shorten the scar because that is my main concern, my patients will compromise their shape and contour for a few short centimeters of scar. This nullifies the entire purpose of your extended tummy tuck. I don’t make the scar longer than it needs to be, but I’m certainly not a prisoner to the scar. There is no standard cost for an extended tummy tuck mommy makeover as there are many unique variables. Below is a list of the elements that will determine the cost of your procedure so you understand what exactly you are paying for. The skillset of your surgeon. Is he or she a plastic surgeon or a cosmetic surgeon? Is he or she board certified? A board certified plastic surgeon will often be more expensive. How long it takes to perform the procedure. Generally the faster your surgeon, the less facility and anesthesia fees and the greater the surgeon’s profit. Therefore, surgeons have an incentive to work more quickly. When it comes to surgery, faster is not better. Be sure to ask your surgeon how long the procedure will take and be wary if it seems too quick. The average time for an extended tummy tuck is: 4-5hrs. Below are specific questions to ask your surgeon during your consultation. Each of these will allow you to understand his or her approach and thus make an informed decision. To print these questions so you can ask your surgeon, see link below to download a copy take with you to your consultation. Do I have enough extra skin on my flanks that I require an extended tummy tuck, or is a standard tummy tuck sufficient? In many cases, pregnancy can cause a buildup of loose, excessive skin that extends beyond the abdomen. When loose skin can be seen on the flanks in addition to the tummy, an extended tummy tuck is the correct procedure to eliminate excess skin and tighten the underlying musculature. Will the length of my incision fully address all excess skin? A tummy tuck is not about the length of the incision, but rather the contour of the abdomen. A shorter scar with poor contours is not better than a slightly longer scar with smooth and beautiful contours. Will my tummy tuck include mons rejuvenation? Dr. Rahban will rejuvenate the pubic area and the mons. Plastic surgeons will often ignore the pubic region, leaving it sagging and puffy. They only rejuvenate the abdomen and reattach it to a puffy mons. With every single tummy tuck, Dr. Rahban rejuvenates the mons or pubic region. He removes excess fat from underneath the mons and removes excess skin. He then lifts up the mons and re-secures it to the abdomen, creating a younger looking pubic area. Do you close my incision or does someone else? At many cosmetic surgery facilities, the surgeon allows another person to close the patient. This is not the case with Dr. Rahban—he doesn’t let anybody else touch his patient. Do you use layered closure? In closing the incision, Dr. Rahban employs layered closure. He starts from the bottom and meticulously closes each individual layer of tissue outward to the surface skin. By properly aligning the layers from the inside out, he ensures there is no depression on the resultant scar. Do you offer a second consultation prior to my procedure? Every patient goes through a thorough pre-operative process. This begins with a pre-op visit two weeks prior to surgery. This is similar to a second consult. During this time, you will go over the details of your surgery with Dr. Rahban, and you will get a second opportunity to ask questions and go over your procedure, thus ensuring a complete understanding. How many follow-up appointments do we have? After a tummy tuck, Dr. Rahban schedules a total of five follow-up appointments. Most plastic surgeons schedule two follow-ups, during which time you may not even see the doctor. During every follow-up appointment, Dr. Rabhan sees his patients personally.